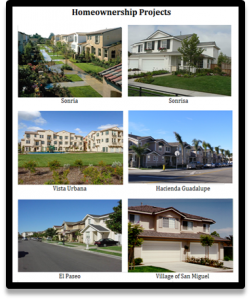 The City Council of the City of Oxnard adopted the City’s HCD-required 2013-2021 Housing Element on October 10, 2017 (Resolution 15,060). The 2013-2021 Housing Element provides housing and affordability information for the City, uses an HCD-assigned target of 7,301 new units as a new housing goal, and establishes 31 implementing programs to be administered by various City departments. One of those programs is the “Inclusionary Housing Program” (information below) administered by the Affordable Housing & Rehabilitation Division. Visit the City’s Development Services Department website for more information on the other programs https://www.oxnard.org/oxnard_affordable_housing/. In general, developers of new residential projects containing ten (10) or more for-sale or for-rent dwelling units are required by the City Code to either make an in-lieu Affordable Housing Payment to the City’s Affordable Housing Trust Fund or provide 10 percent of the total units as on-site affordable housing in the manner specified in Ordinances 2615, 2688, and 2721 (PDF). Unless authorized by the City Council in advance of the development application being processed by the City, the default is to provide the affordable units within the project and record a deed restriction for at least 20 years. Only households that can be documented to have a household income in each unit’s respective affordability range may buy own these units whenever available. There are approximately 721 Low and Moderate Income Inclusionary Restricted units throughout the city. Upon sale of these units, the Affordable Housing & Rehabilitation Division calculates the resale value using the formula stated in the Resale Restriction Agreement pertaining to each unit; property cannot be listed for more than the calculated value. The buyer of the unit would need to meet the Low or Moderate-Income guidelines, depending on the restriction the unit. The Affordable Housing & Rehabilitation Division does not keep a list of properties for sale as they are listed individually by each owner’s agent. Contact your realtor in order to be informed when one of the affordable restricted units is listed for sale. If an affordable restricted unit is listed for sale, please contact the listing agent for more information. The Affordable Housing & Rehabilitation Division provides all the information and needed requirements to the listing agent ahead of time. Therefore, Realtors, not the City, will be responsible to make sure the interested buyers meet all the necessary requirements as far as income and to inform them on the price, and the resale restrictions and owner occupancy the new buyer will be assuming for the remainder of the restriction period. Once an offer is submitted and accepted by the seller, the buyers will submit an application with the City to be reviewed for eligibility. Applications will not be accepted without an accepted, fully executed offer. Moderate Income Restricted Units can only be purchased by a moderate income household whose income is above the low income guideline (80% AMI) but below moderate (120% Ami), and are not eligible to receive any downpayment assistance. Below is the link to the list of the affordable restricted properties. * Those units which have been foreclosed no longer have a restriction by the City.